For the most part, the naming of bands is fairly logical based on location, type, or business association. It stands to reason that if a band was associated with a town, then that would be the town band, however there were a number of exceptions – the naming of some of the early private bands comes to mind. Likewise, if a band was in a locality and associated with an industry, similar naming convention would follow, such as Newcastle Steelworks or South Australian Railways. This gave the bands an identity and a purpose. Where two bands existed in the same area, there was undoubtedly some disagreements, although not generally over naming but over status and prestige…and performances! If a band was given an Australian or State name, that lifted their reputations almost immediately, yes? Possibly, but there were other factors involved. The focus of this post is to explore a level up from the local bands where we delve into the rare State and National bands. Granted, there were not many of them. In fact, in the time period that is being focused on in this post, these types of bands were thin on the ground. In a previous post we explored the life of the ABC Military Band, a unique ensemble in its own right and one that included bandsmen from all over Australia. This was a representative band but different to the more common brass bands in that it included woodwind and percussion. In this post we will highlight brass bands. Admittedly, there was some difficulty finding material on these rare bands due to their short periods of existence. That being said, there were other bands in Australia aside from the more notable ones and mention will be made of them. We will also see how a certain State band raised the ire of the governing body of its home State. There is no doubt that being part of a National or State band was one that bandsmen aspired, and for the National bands, the best bandsmen were picked for a proposed or grand world tour. The one State band that was set up did so in unusual circumstances and the naming of them as a State band brought them much recognition and pride. With this in mind, National and State bands did exist and although they were sporadic and formed mainly for tours, they developed reputations in their own right and gave more bandsmen another musical outlet. The Salvation Army had begun planning for this band twelve months in advance, with the aim of the band being “the kind of which should tour the colonies and encourage the members of the Army, and by producing music of a high order raise funds for the work in the different parts of Australasia” (“SALVATION ARMY FEDERATION.,” 1898). By the time the band had reached Adelaide it had already toured from Melbourne to Western Australia, back to South Australia and from there had been to the Yorke Peninsula and Broken Hill (“SALVATION ARMY FEDERATION.,” 1898). According to another article published in The Advertiser, the Federal Band was a very fine combination of musicians and presented a wonderful concert (“SALVATION ARMY.,” 1898). As it is ever thus with Salvation Army bands. In 1908 a tiny article was published in The Sydney Morning Herald in which the title is misleading. As you can see in the article (pictured), there is no “Commonwealth Brass Band” that has been formed. Rather, it is a proposal to secure the services of the Newtown Brass Band to perform at the Anglo-French Exhibition (“COMMONWEALTH BRASS BAND.,” 1908). By all accounts the Newtown Brass Band was very famous having won numerous competitions by this time, and could have probably served as the Australian band at the exhibition (Greaves & Earl, 2001). However, the Prime Minister apparently rejected this proposal for reasons unknown. In terms of true Australian brass bands, the main one that is spoken about is the ‘Australian Commonwealth Band’ which was conducted by the great Albert H. Baile on two world tours – but more will be talked about this band in the next section (Sharp, 1993). However, preceding the ‘Australian Commonwealth Band’ was another ensemble which was known as the ‘Australian Imperial Band’ (AIB), formed by Mr W. M. Partington in 1924 (“AUSTRALIAN IMPERIAL BAND.,” 1924). Mr Partington is mentioned in some references – he did conduct the Ballarat City Band from 1909-1910 (Pattie, 2010). However, he is not really noted amongst some of the more famous bandsmen of this time. That did not stop certain newspapers like the Ballarat Star waxing lyrical about his musical and organisational abilities (“AUSTRALIAN IMPERIAL BAND COMING.,” 1924). Nevertheless, it is evident that in much later years he managed to form a true National band and while it seems he never took the band to England, he did take it on tour throughout Australia. However, as discussed in a previous post on bands that went on tour, it is a very expensive undertaking and the picture of the AIB (below) published by the Mirror newspaper in Perth is telling. One could assume that by the time the AIB reached Perth, their general touring money had run out. Which is probably a reason why there is no mention of the band travelling to England. The length of time this band was in existence was short however they managed to get themselves together and go on a grand tour of Australia, to some very favourable reviews. There is not much mention of the personnel of the band but given there were many quality bandsmen in the country at the time, finding gifted musicians was probably not a problem. Albert H. Baile was one of the most famous band directors of this time and he had a masterful way of conducting his bands (Greaves & Earl, 2001). 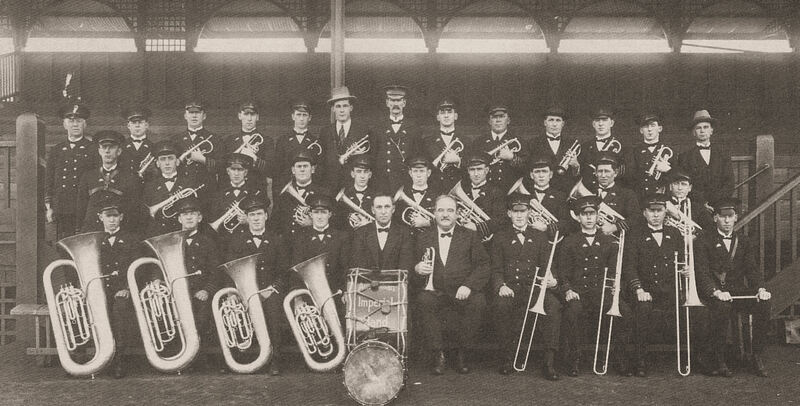 No sooner had Baile returned to Australia in 1925 with his Newcastle Steelworks Band, he made moves to reform the band in Sydney as the Australian Silver Band and apparently included some Queensland bandsmen in the new ensemble (“AUSTRALIAN SILVER BAND.,” 1925). Including some bandsmen from another State could probably justify the name change an Australian band. 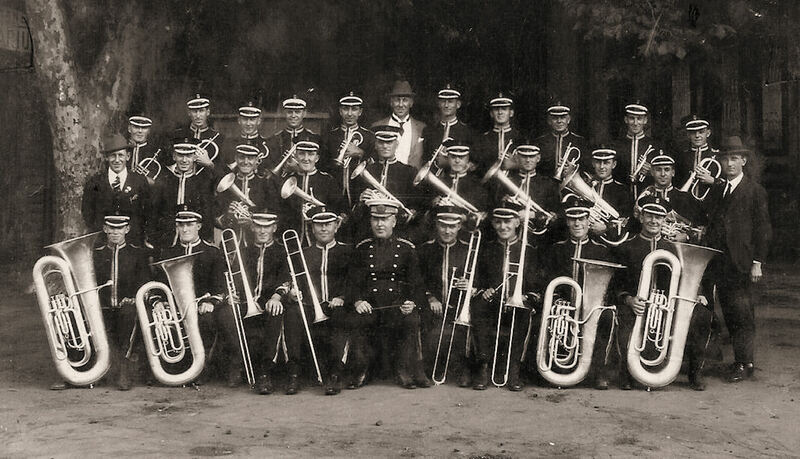 However, given the huge reputation of the Newcastle Steelworks Band after their competition wins, the name change stuck and the band proceeded on their first international tour to wide acclaim (“AUSTRALIAN COMMONWEALTH SILVER BAND,” 1926). The band name seems to have begun evolving into the Australian Commonwealth Band in various media with the dropping of the world ‘Silver’ from it, hence the more recognizable name being etched in history. We see in the various photos and ephemera included in this post that they were a very smart looking ensemble, and that they had a distinctly Australian look with slouch hats. 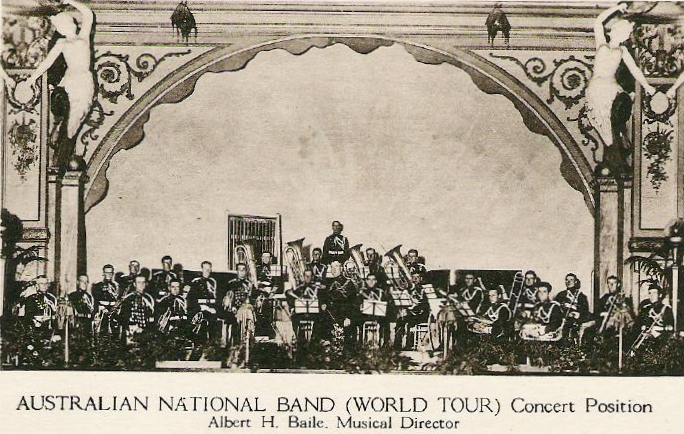 The Australian Commonwealth Band undertook two Australian/World tours, the first from 1925-1926 and the next from 1926-1928. As in their first tour, they received rave reviews during their second tour, of which an article in New Zealand’s Evening Post from February 1927 provides a brief summary (“COMMONWEALTH SILVER BAND,” 1927). This second tour was not all plain sailing. 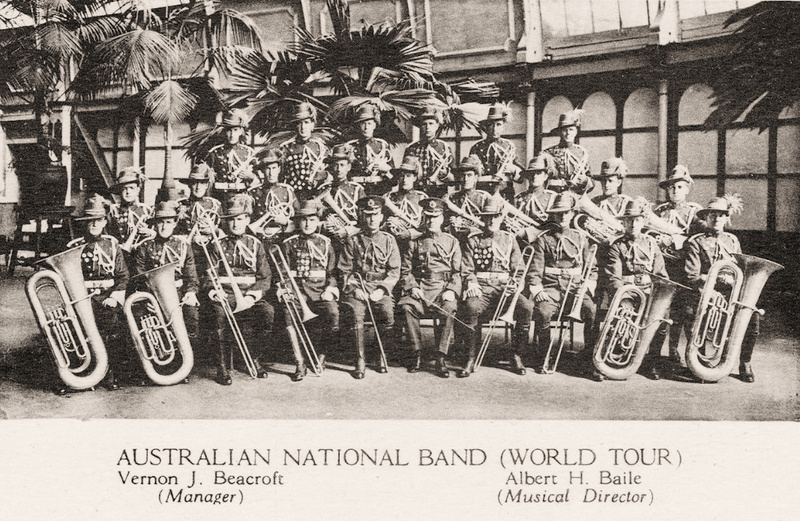 While the band was travelling around Australia, the Australian Musicians’ Union was up in arms about a boycott of the Commonwealth Band while it was touring America (“COMMONWEALTH BAND,” 1927). The Union started lobbying for retaliatory action against musicians visiting from overseas. It is unclear how this action was resolved however it is interesting that despite the reputation of the Commonwealth Band, there was this hiccup while on tour. 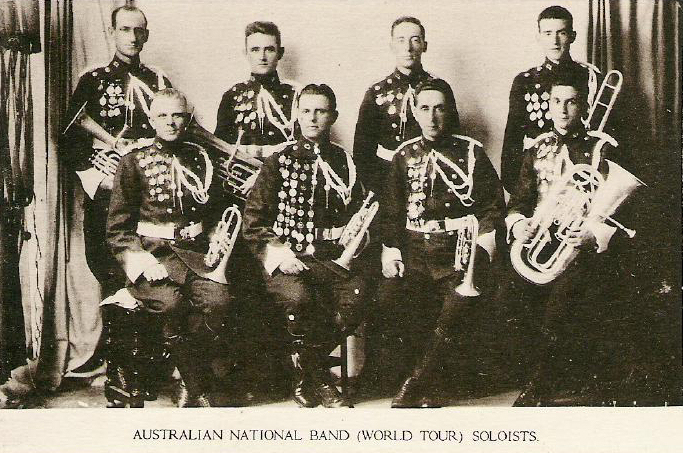 The Australian Commonwealth Band was disbanded in Sydney in early 1928 after they had finished their last tour of Australia (Greaves & Earl, 2001). There is no doubt that this was a truly remarkable ensemble, started from the players of the Newcastle Steelworks Band to become a unique band in its own right. And it certainly boosted the reputation of Australian bands in general. The legacy of this fine ensemble was felt for years to come. In the early 1930’s, we see the formation of the one and only State band, the Queensland State Band. This was formed in unusual, but possibly well-meaning circumstances as the musicians were notionally “unemployed” (“QUEENSLAND STATE BAND.,” 1933b). The other aim of the band was to try to emulate the success of previous tours by the Newcastle Steelworks Band and the Australian Commonwealth Band by touring overseas and competing in England. Nevertheless, the band formed in September 1933 and included previous members of the Australian Commonwealth Band (“QUEENSLAND STATE BAND TOUR.,” 1933). Almost immediately this band raised the ire of the Queensland Band Association (QBA) of which sent an annoyed letter to the Courier Mail published on October 9th, 1933. In the letter, the QBA Secretary of the time, Mr J. R. Foster made some forceful points about the State band not being “tested for proficiency” under QBA rules, and the fact that the State band was professional yet had excluded some Queenslanders by bringing in bandsmen from Southern States (Foster, 1933). In addition, apparently the Lord Mayor of Brisbane had allowed the State band to perform in a park while excluding other Brisbane metropolitan bands (Foster, 1933). It is fair to say that this letter (and the QBA) failed to have much impact on the operations of this band. After being brought together, the Queensland State Band commenced a tour of Queensland where they visited many towns and rural centres north of Brisbane. The receptions they received were enthusiastic and many a town newspaper gave them favourable reviews of their playing (“QUEENSLAND STATE BAND.,” 1933a). Indeed, they also inspired many local town bands and schools, and it is noted that they played for a combined total of 20,000 people over the course of the tour (“STATE BAND DOGGED BY RAIN,” 1933). After this part of the tour ended, they were supposed to tour through Northern NSW and also raise finances for a trip to England, of which either activity does not appear to have happened. As mentioned, this is one of the only instances during this time where a State band was formed. It is unclear why other States did not form their own representative bands. However, it does indicate that where there is a drive, things will happen even if all the aims are not met. There was only one more band to carry an Australian name during this time period, a band that was very short lived – the ‘Australian Girls’ Brass Band’ which was formed in 1934. We know how rare female bands were through a previous post, so perhaps this was a tokenistic ensemble. However, they were formed and presented one concert in Sydney where they were not exactly complimented for playing, but apparently looked very smart in green & gold uniforms (“Australian Girls’ Brass Band,” 1934; “FIRST CONCERT,” 1934). There is no more record of this band doing anything else beyond this one concert. If there is anything show from the stories of these ensembles it is a distinct similarity between them. They were all formed basically for the one activity, which was touring. Except that this aim was obviously dependent on having enough money. That being said, the Australian Commonwealth Band took things a few steps further by acting on their aims to compete in England and tour around the world, and it was a band that was in existence for the longest time. Certainly, the fact that the Commonwealth Band undertook two world tours in quick succession is testament to the organisation and prowess of its manager and conductor, no doubt both well-honed from the previous Newcastle tour. In any case, once again we see that these bands added to the reputation and life of Australian banding and through them, we have seen some interesting histories. Perhaps there are lessons to be learned and no doubt there are further stories to be unearthed. We do have a unique history of bands in this country and having bands that carried the Australian name or a State name gained for themselves a distinct historical legacy. Greaves, J., & Earl, C. (2001). Legends in brass : Australian brass band achievers of the 20th century. Kangaroo Flat, Vic. : Muso’s Media. Pattie, R. (2010). The history of the City of Ballarat Municipal Brass Band 1900-2010 : one hundred and ten years of music to the citizens of Ballarat (Rev. ed.). Ballarat, Vic. : City of Ballarat Municipal Brass Band.